In the middle of the night or during the day, or at anytime, a request will come over the PA system for a type of blood from a prescreened soldier. When an soldier is WIA or an accident happens there isn't a blood bank here, but live soldiers that are prescreened that answer the call for blood. Yesterday we had a prescreened blood drive here on FOB Fenty. Here are SSGT Robert Shaw from Harrison, Main and CPL Powell from Spokane, Washington hawking for the 4th BCT 4th Division that's coming in to take the place of the 3BCT Division that's redeploying. One ounce vials are taken of all the soldiers who participate and then prescreened and kept on file. We have had two such requests for blood since I've been here this week. I am impressed that what ever the time of day or night the request comes, soldiers run to the aid station without question. 4 BCT 4th Infantry division has a Female Engagement Team. 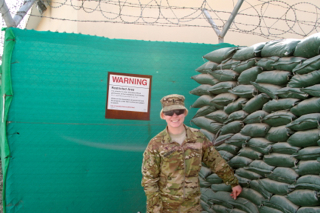 I had the opportunity to meet 1LT Marissa Readinger who is on her first deployment. She is very passionate about what she does and a little nervous about the unknown. Her greatest fear is if she will have the emotional ability to deal with what happens. This is her third year in her five-year commitment for West Point. She is a great representative of women in the armed forces and advocates for women as long as they are not combat distractions. I got a chance to meet up with a couple of amazing soldiers today, Corp Michael Moynihan of Shelbyville, TN and Spl Ryan Craft of Colorado Springs, CO. They are great friends to one another and both fully admit and brag about being rednecks, enjoying four wheeling, shooting and drinking Jack. In fact they've created their own signature drink: Jack, Puckers and sweet and sour mix..."It's the worlds greatest drink!" Truth be told, they are both extreme soldiers. Corp Moynihan recently won the Silver Star for what is now being touted as the Battle of Shal. What they've learned here in Afghanistan are coping skills. Both have seen their friends die and both are heroes. 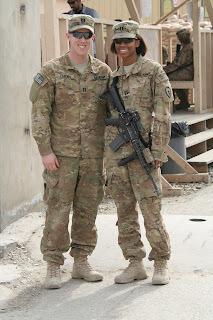 Couples who deploy together, stay together...it's called the Army Married Couple's Program. Married couples are assigned within 100 miles of one another. I had met a few halves of couples on my deployment last year, but I finally got to met a whole couple, both Captains, the Leach's. Capt Ryan Leach and Capt Ashley Leach both met at LDAC in Ft. Lewis in 2006, but went their own separate ways. They met up a few years later and the rest is history. 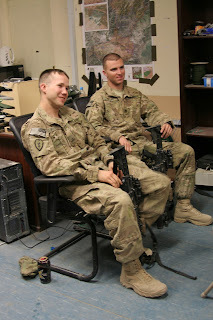 Once deployed into Afghanistan they only planned on seeing each one once a month, but working the system a little they both ended up on FOB Shinwar. They like being deployed together generally, but suffer from the same things most couples suffer from, however a little more exacerbated here. It's a little hard to get away from one another when you're living in a two man room the size of a large walk in closet and you can't get off the FOB. Yes all soldiers have their weapon with them at all times. Ashely actually sleeps with hers, I know this because I bunked next to her, Ryan carries a 9mm which is holstered so it's not visible in his picture. The Leach's have made the best of their deployment together and they're headed back to Hawaii as I'm writing this. Today I attended my first memorial service. 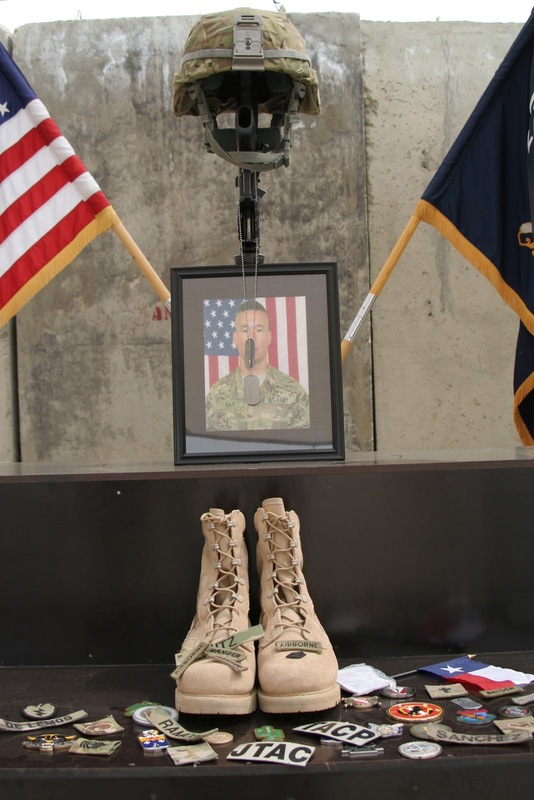 It was on FOB Joyce in Kunar Province in honor of 2LT Clovis T. Ray. I have attended a ramp ceremony before where the body, draped with an American flag, is wheeled down a ramp to an awaiting helicopter. A truly moving experience that I feel every politician should have to attend. But at the memorial service the soldiers comrades give tribute. I was markedly impressed with the poise these young men had speaking so lovingly of their "gun-dog" platoon leader. After the tributes there was a "Last Roll Call" where the names of the platoon were called out and the soldiers answered, all but LT Ray. Then came the gun salute and finally "Taps" was played. I now understand why the Veteran's I have met, do not like Taps. But what really got you was when each soldier went up to LT Ray's boots, saluted, kneeled, some touched his dog tags, rose and then saluted again. Some left offerings of medals and badges. As we flew back from the service on our Blackhawk helo, passing over the sepia colored landscape, I couldn't help but wonder how much we've really accomplished over here in Afghanistan. Landing at FOB Fenty, it seemed like I had just left and at the same time it seemed as if I'd been gone for years. The base looks smaller than I remembered and dustier, if that is possible. As I lugged my duffle across the runway I noticed the flags at half mast. I later found out it was for a soldier who was killed yesterday. I'm here because the 3BCT 25th Division is going home...that soldier's going home too, but in a box. The base is crammed with soldiers as the TOA has begun. I knew they would be happy to see me because it means they're just that much closer to going home.